BostonDirt reports she got to see her first storrowing, about 11 a.m. on Soldiers Field Road. 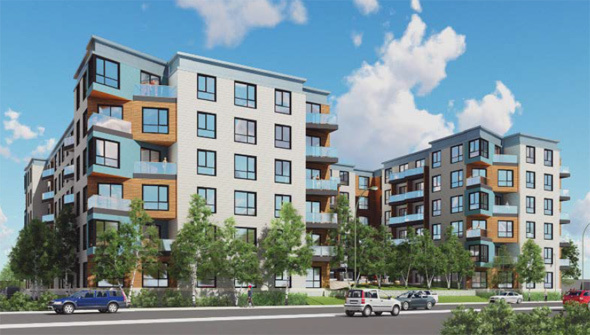 The Board of Appeals this week approved a developer's plans for a 211-unit apartment building on Soldiers Field Road near where Western Avenue and Birmingham Parkway and a separate building with 38 affordable condos. Read more. 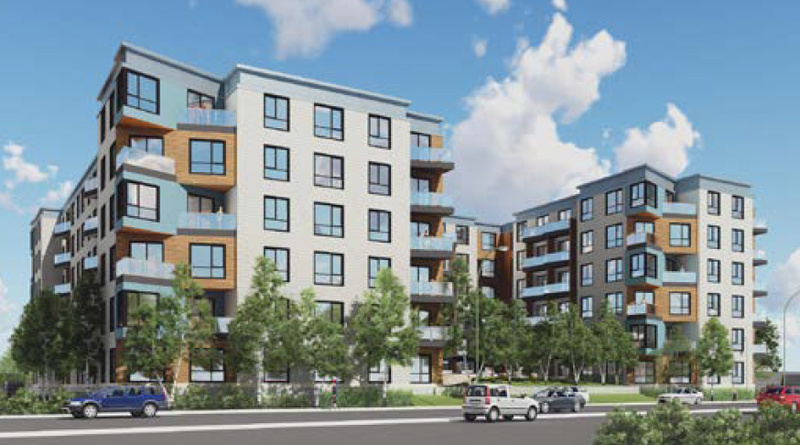 The Board of Appeals today approved plans to replace the old Martignetti liquor store on Soldiers Field Road with a Maserati and Alfa Romeo dealership. Read more. 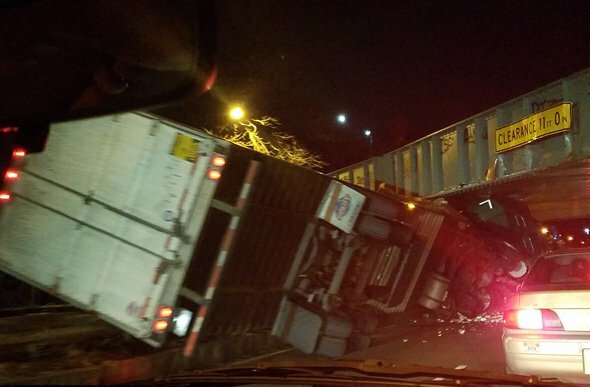 State Police report arresting a Jamaica Plain man on drunk-driving charges early today after a trooper supervising a storrowed tractor-trailer inbound at the BU Bridge spotted him driving a van outbound despite the lack of two tires. Read more. 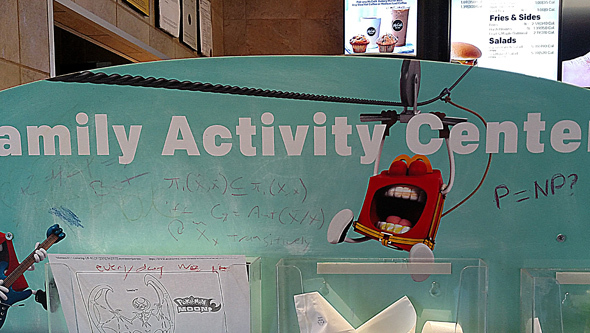 Looks like some kiddie got bored with the crayons and coloring pages at the Soldiers Field Road McDonald's on Soldiers Field Road in Brighton and decided to while away the time recreating Will Hunting's work at MIT. 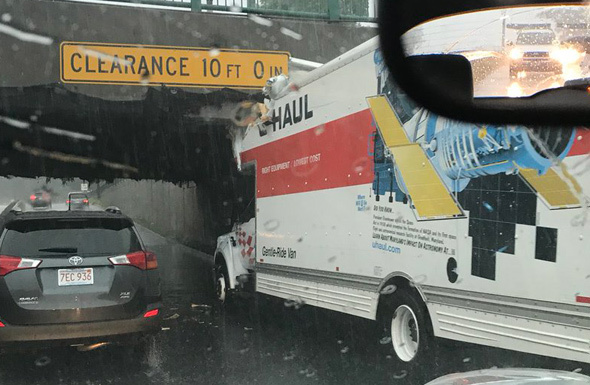 JMac captured the aftermath of the storrowing at North Harvard Street this morning. JGoodell gives us another view. And look: Video of the truck driver trying to move his roof off the roadway. 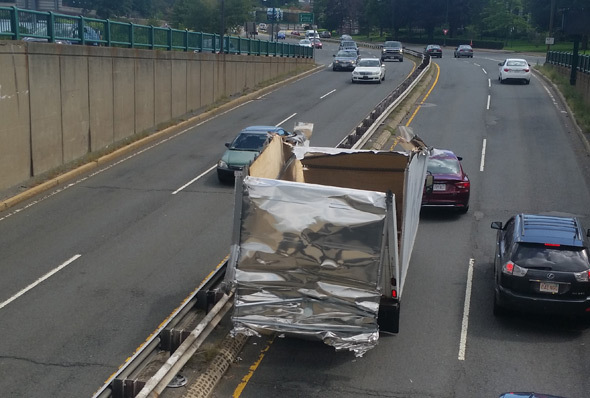 And it turned into a classic Boston tableau: A storrowed truck and a couple of iced coffees from Dunkin' Donuts: Read more. John Keith reports that Fiat Chrysler is paying $14 million for the soon-to-be-shut Martignetti Liquors on Soldiers Field Road. Boston Police report arresting a Belmont man yesterday after he started an attack on a Boston cop by throwing a nearly full beer can at his head. Read more. Drivers on the river roads seem intent to make up for last year's absence of good storrowings over Labor Day weekend. 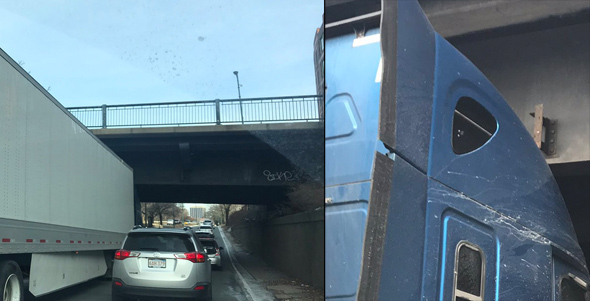 James Sappenfield spotted a spectacularly storrowed truck on Soldiers Field Road inbound by the Harvard Business School around noon. 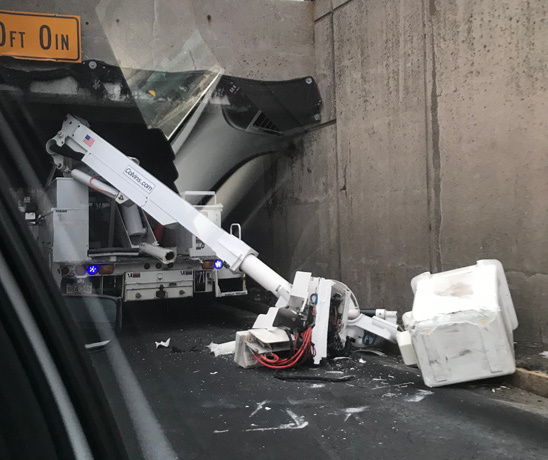 A rental-truck driver brought Storrow Drive inbound to a halt around 4 p.m. with another storrowing that left his truck looking like an occult hand had had some fun with a giant can opener. Read more. Sarah Sahni reports she snapped this photo at 4:15 p.m. today. Better luck next year! 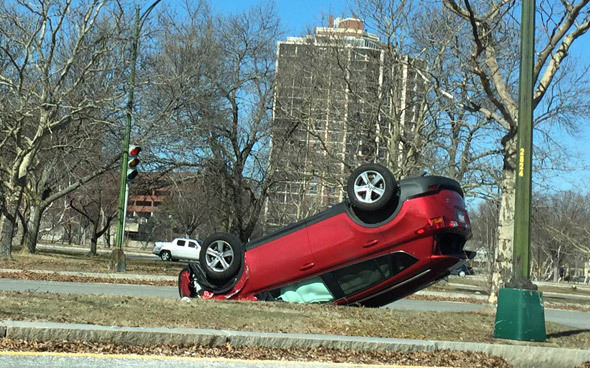 Paul the roving UHub photographer spotted this car-turned-turtle this morning on Soldiers Field Road by the Eliot Bridge in Brighton, around 11:10 a.m. He reports the driver got out by herself, seemed OK and that when he called 911, they reported police were already aware. Jesus Christ, can't any truck drivers read? 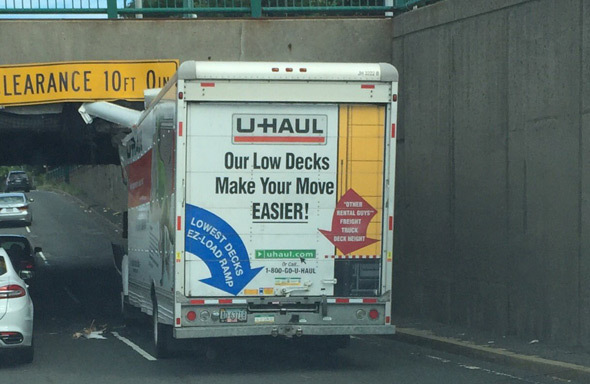 When Storrow is bumper to bumper at 6:30 in the morning, you know there’s a truck. Driver and passengers seem to be okay.